Eeeek, today is such an exciting day! 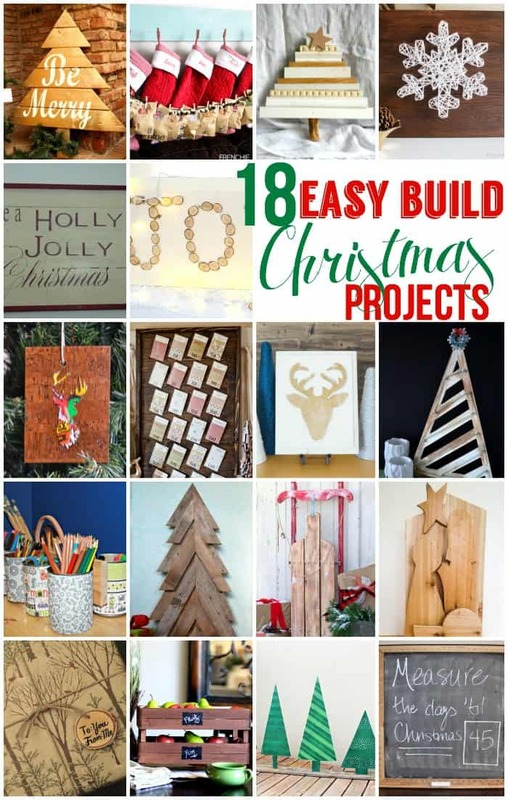 First I brought you the Merry Mag announcement (a must see), and now I’ve teamed up with an awesome group of gals in their tool belts to bring you nearly 20 Easy to Build Christmas projects! Since getting my hands on some new Ryobi tools a few weeks back I’ve been working away in the wood room building all kinds of little Christmas projects, like the fun Stocking Hangers I shared last week. The Ryobi tools are light weight, not intimidating at all, and perfect for a beginner like me. Back a few weeks ago while surfing Instagram I came across some to-die-for Vintage Sleds, but the price tags were in the $100-$300 range!! No thank you I thought, I knew I could come up with something for MUCH less… and I did! Did I metion MUCH less? How about $10?!! 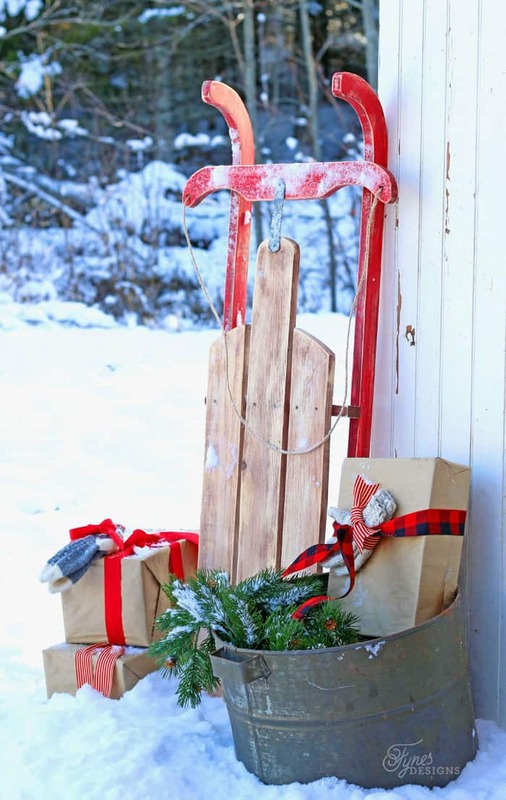 Follow along to see how you can make an easy DIY Vintage Sled too! I doubt you’d get very far on this little toboggan, but it certainly makes a cute addition to your Christmas decorations! First you will need to download and print the pattern pieces at the bottom of this post. I created all the pattern pieces to fit standard size paper, Cut out pattern pieces as directed (** two of the pattern pieces must be cut on the fold of a larger piece of paper). Below is a diagram how the pattern pieces will fit onto your pine board. Using the Ryobi Jig Saw, cut out pattern pieces. I find much easier to paint the sled pieces prior to assembling. 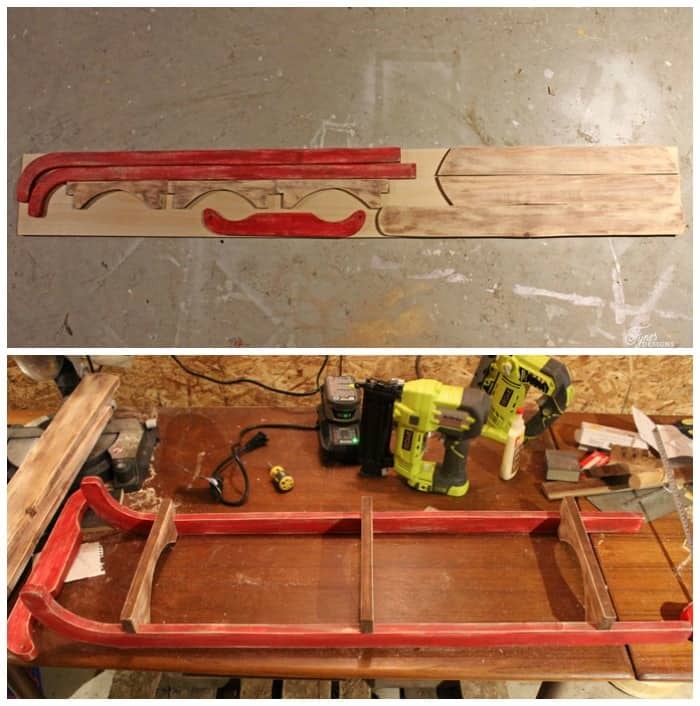 Assemble the sled pieces by placing the 3 braces 15″ apart between the skis. Attach with wood glue on the angles of the braces and use the Ryobi Airstrike Nailer to fasten (two nails going from the outside of the ski into the brace at each brace). Line up the seat pieces with a 1/4″ gap between each slat. Attach with wood glue on the underside of the slats and use the Ryobi Airstrike Nailer to fasten. (two mails in each slat on middle and back brace. Nail carpet tacks on the surface of the seat for appearance if desired. Attach the front head piece in the same manner. Drill a small hole on each of the outer edges for rope handle. **Optional- Add a small piece of metal or tin from the longest seat slat to the head piece (I used a piece of an old stove pipe that I cut into shape and drilled two small holes to attach, but you could also use flashing). 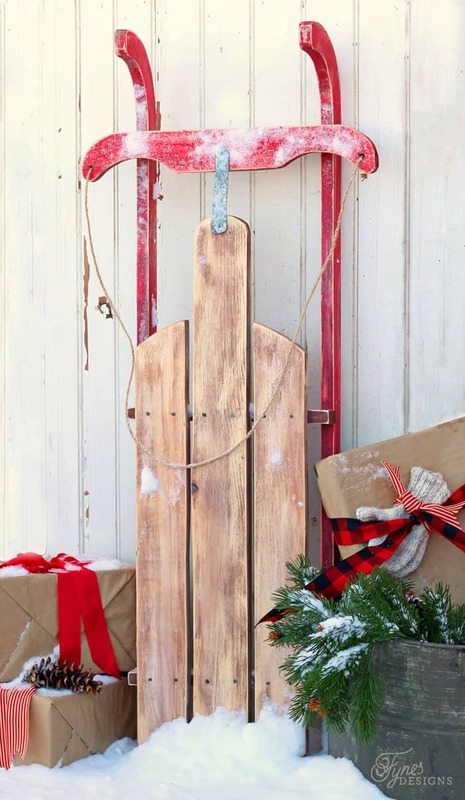 You can dress this sled up in a bunch of ways to add a little vintage touch (without the vintage price tag) to your Christmas decorations either indoors or out! 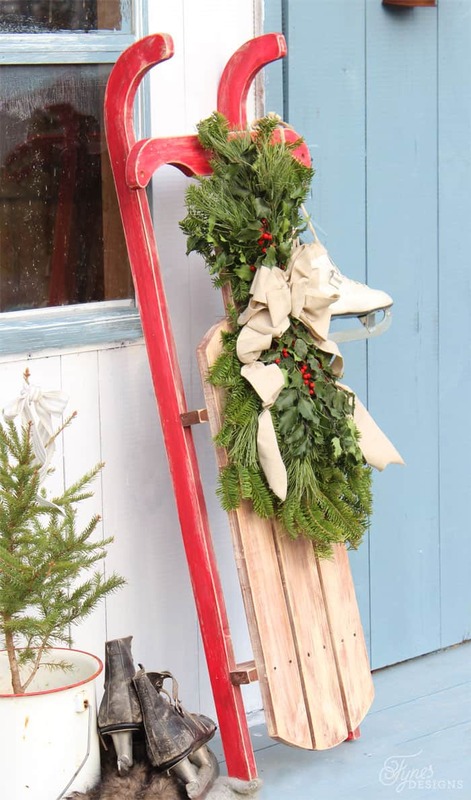 This DIY Vintage Sled makes the perfect back drop for a natural swag or wreath. You can learn how to make a Christmas swag here and a Christmas Wreath here. I love this sled! What an awesome project. Being a resident of the Chihuahuan desert, I can pretty much guarantee this is the ONLY way I’d ever get a sled, vintage or not! I’ve been seeing posts from people decorating sleds and I really want one. Too bad my handyman isn’t so handy anymore. This is amazing Virginia! Who knew you could rock a jig saw like that?! You are multi-talented my friend! This is absolutely incredible, Virginia! You are so talented! I love it! Oh, I love this sled. I love that it’s made from just one board. Going on my to-do list! Pinning, too! Thanks for putting this hop together – lots of great projects to inspire! So glad you joined Jeanie! thanks for stopping by! So stinking cute! And really not that difficult. This is so cute!! I love it. Pinning it! This is beautiful! Very creative and I love that you included a template too. Great job! I am in love with with sled! 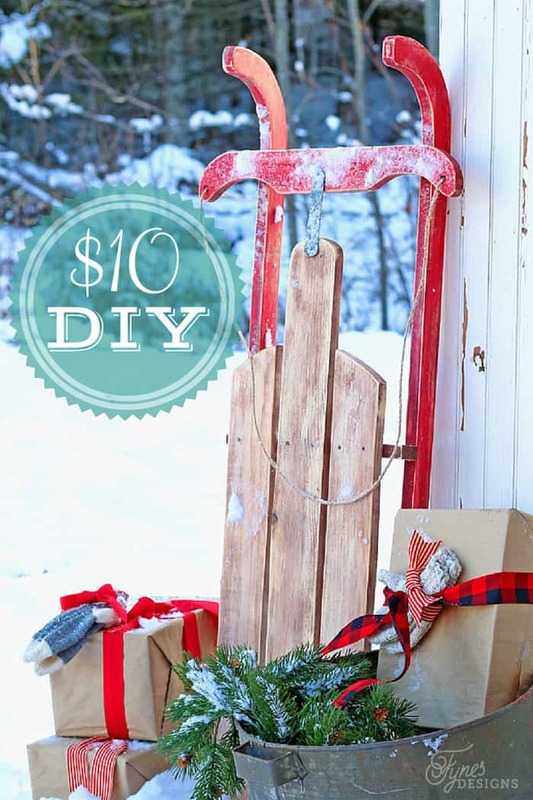 I too have been wanting those large vintage sleds and this is just perfect and so easy with those Ryobi tools! Thanks Lindsay! I wanted the real deal, but not the real deal price. This is the perfect compromise! Wow, that’s some project. Pinning. Maybe one day I’ll overcome my wood cutting fears. Love it. Give it a go, you’ll be great! The Ryobi tools are perfect for beginners! Wow Virginia – I am so impressed! When I first saw the pic, I thought it was real! Way to go – great project! Thanks Dani, I had fun creating it! Great project!!! I would have never guessed it wasn’t real. Putting this in my to make pile. Thank you for the pattern and the easy instructions. Can I just kind of say you are my hero? This is amazing! I’ve seen the cute sleds for sale before, but you’re right, the prices are awful! So pretty. I’m definitely following your ingenious blog. Thanks Meagan! If this one gets hurt, you’re out $10! I love this little sled! Thanks for linking up at the Thoughtful Spot Weekly Blog Hop! We hope you stop by again next week! Woah, that turned out great – I’m impressed!! It looks lovely how you’ve arranged it too, very merry vintage! I am totally smitten with this!!! 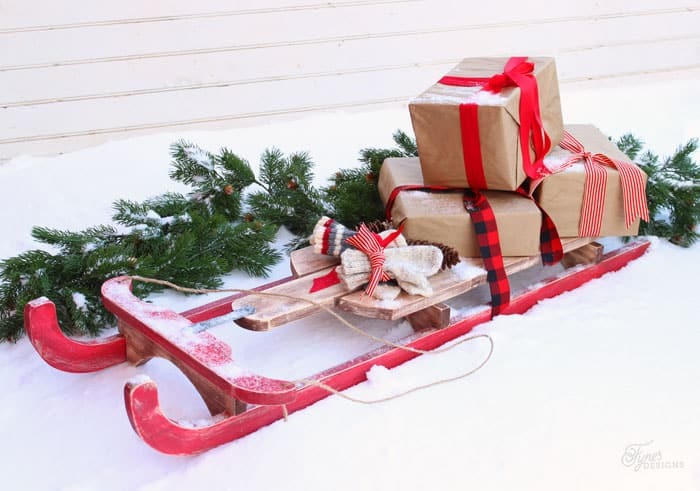 I so wanted a vintage sled and couldn’t find one – nor do I want to pay several hundred dollars for one! You ROCK!!! That sled is gorgeous, Virginia!! Seriously, it looks like a $300 sled! We are on our way to Home Depot for wood this morning… I’ll be adding to our list! Thanks SO much for sharing, friend! I DON’T SEE A LENGTH FOR SEAT SLATS ANYWHERE? I CAN GUESS AT IT WELL ENOUGH BUT FOR THOSE WHO CANNOT SHOULD YOU SUPPLY THIS INFO? nice project by the way! your sled looks great! I have fond memories of my mom decorating at Christmas time with my grandfather’s childhood sled. I am a little intimidated with power tools but your sled looks amazing! You did an outstanding job and I love the different decorative stagings you created. Maren, you should definitely get your hands on some Ryobi tools. I find they really take the intimidation out! I love this so much! I just showed my husband and am doing some heavy batting of my eyelashes, begging him to help me make it! This is so perfect! I have been “fighting’ with my sister in law for the one she and my husband had as kids. Now I can make my own! Also now following your blog! Thanks! Beautiful project and great tutorial. I’ve been seeing these vintage sleds and wondering where people found them. Ha! Now I can make my own. 🙂 Pinning and featuring you this Saturday at Show Me Saturday link party. This sled is amazing. I must run (not walk) to go make it. Awesome project….. I made one for a girlfriend and one for myself. Thanks so much for posting this…. Happy Holidays ! All I want for Christmas are Ryobi power tools!!! Oh, I have been a gooood girl. I LOVE this!! I do just a little woodworking and have been thinking about purchasing a jig saw. Now I have to purchase that jig saw because I have to have this sled!! You did an impressive job! Thank you so much for the instructions and pattern. Very generous of you!! Merry Christmas!! Thanks Elaine, yes get yourself a jigsaw! I love mine, and use it ALL the time, so multi purpose!! Okay, I’m off to scout out my hubby’s shop. I’m sure we have most everything I need other than picking up the wood. Thanks for such a great post, this is one of the best sleds I’ve seen! Great job!! This was such an awesome project! Me and my husband made this together and it turned out GREAT! ! Thanks for such an awesome post. The measurements and downloads were so helpful! Thanks a bunch. I saw this the other day on Pinterest and just had to make one. Thank you for the detailed tutorial. I posted the one I made to my blog and wanted to share with you my sled. All links to your awesome Vintage Sled have been shared 🙂 Thanks for such a fun project! Thank you SO much for these instructions. They were incredibly easy to follow and I made two sleds – one each for niece and nephew. They both love vintage anything. Yours is amazing! Virginia, I just loooooove this sled!! I hope I can be able to try for this next Christmas. What is the width on the sled braces? Or maybe the dimension on the cuts. I love this and can’t believe it only cost $10 to make! And I love your photos! Hi, what paint did you use for the two colors? Thanks! I used some outdoor paint I had on hand, and a bit of stain also on hand. Teh Red was bubble gum red from Voice of Color. WOW!!! I can’t wait for winter, and that’s saying something!! Thank you so much for this pattern! I have made 2 sleds! I had to modify it a bit to fit with our available wood. The 1×10 pine boards here are glued together and i had a real problem with the wood breaking on the skis and handlebar. So I used 1×6 pine fence boards. I also made one seat in cedar. I had to use my scroll saw to cut out my pieces as i have not found the right jig saw blade to make those cuts. I really found it so simple to follow the pattern and liked the printable template. The next one I make will be perfect! I so happy you gave the pattern a go! Thanks for reporting back, really makes me smile!! I do not see a link for the pattern at all. Im am really wanting to make this. THere are 3 pdf links after right before the last photo. Tilted sled braces, skis, and seat. Good luck! Thank you so much for providing the printouts! I modified the measurements for my needs and just cut out all the pieces, and it looks amazing! Quick question about your red paint and finish; how did you get the red to look “vintage”? Did you mis your paint with a stain or thinner? Did you do a thin coat and then sand to get the wood grain to show through a bit? I’d love any insight you could offer, thank you!! I cannot find the link to download the pattern. Seriously this is the BEST DIY I’ve come across on this particular project!! I kept finding the mini-version that would work as a table centerpiece but that’s NOT what I had in mind. Back up the truck a little because I actually started searching craigslist for the “real deal” and these days once you type vintage, expect to pay BIG $$. My goal was always to decorate and sell these at Christmas Craft Fairs so the idea of buying old sleds died right away. Thanks SO MUCH for creating and posting this project. I’m ecstatic!!! Can’t wait to bust out the power tools and get to work. I’m so happy you found it! I’d love to see your finished project! I love your sled! I had my husband put some old pickets from our fence to use. He built me a sled from your site and I just love it. I can’t wait to decorate it for Christmas. It will remind me of the sled I had as a kid. Thank you for the wonderful idea. That is so nice, thank you Donna! Wow! Adore this! Wanna make it this week. Are the links no longer available. I click. It highlights, but never downloads. Maybe 4 years is too long to expect these to work? LOL! I’m sorry it works on our end! I am SOOOOO happy you gave this a try! I built two of these yesterday for my daughter’s Christmas gifts. Must say they turned out beautiful. I was a little sloppy with my patterns and measurements, which I discovered while assembling really mattered, so I had a little tweaking to do. The black on the patterns cannot show or it adds too much to the width. We painted parts of them red and lightly sanded them down for the vintage look, and stained the rest with a “Weathered Oak” stain. Now my wife wants one too, lol. Thanks for the easy to follow idea! I’m so happy you gave it a try! Hope you had a wonderful holiday, I appreciate your feedback!